Trevor Horn is inviting you into his musical home. Two music production institutions are teaming up to bring you world-class knowledge, insight and inspiration at a brand new event concept. 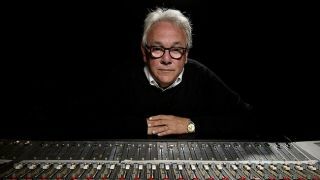 Taking place at the newly-built SARM Music Village - the next generation of the famous studio complex - and in collaboration with Point Blank Music School, it's your chance to learn directly from Trevor Horn, one of the world's great producers. Trevor will be discussing everything from recording techniques to his favourite equipment and production approach, and will be breaking down one of his most iconic productions: Frankie Goes To Hollywood's Relax. This will be a once-in-a-lifetime experience; your chance to learn directly from the man who helped to shape the sound of modern music. Over the course of the day, SARM Music Village's expert engineers will also pass on decades' worth of experience of working with the biggest artists in music through in-depth masterclasses. Later, Point Blank's Ski Oakenfull (Galliano, Incognito) will deconstruct 808 State's Pacific 707 from the ZTT catalogue, breaking down the sounds, notes and chords to show you how the track came together. Finally, Point Blank's Paul Ressell (Faithless, Lana Del Rey) will be giving an insight into the world of sound design and creative composition. There'll also be an opportunity for you to put questions to both Trevor and the SARM Music Village team, hosted by educational innovators Point Blank Music School. This unique day will give you unprecedented access to the knowledge, people and equipment that defined modern pop music, as well as offering you the chance to network with like-minded creative across the industry. Don't miss your chance to be a part of it. Tickets for the event cost £195.00, and can be purchased via Eventbrite.